My-Alia : On Danial and Mr Bee! On Danial and Mr Bee! The ride was so smooth, until we came to the MRR2, which was something like this..
*u know why..? Coz it's School Holiday! Alamak...! When we get home, we had to wait for a while, then this cheeky lil' fellow arrived! He is so grown up! 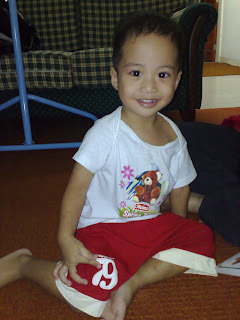 Yet he is still a baby to me.. hihihi..
Oh ya, presenting...... Mr. Bee! 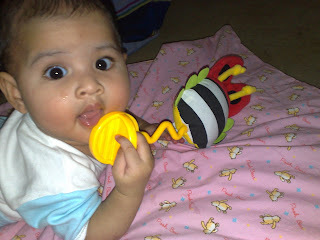 err... Actually this Mr. Bee comes together with Alia's Playgym.. But since my mom said " jangan nak menyemakkan umah aku ye.." ("don't u ever mess up my home"), so we hadn't open up the gym eversince. 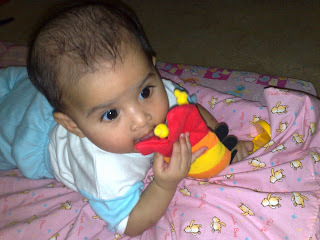 But I still want Alia to play with the toys.. so, i took them apart, and Mr Bee was one of 'em! And another thing.. I can see that she is very fond of putting things into her mouth..
(I thought this habbit comes and goes.. But I think, it never goes anywhere!!) 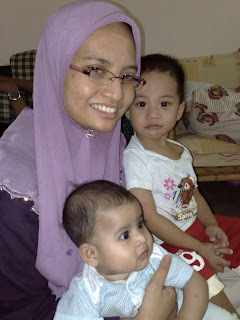 I think i may need mommies' advice on this..
nape cam neil enter frame eh? trime kaseh la krane mem'famous'kan baju plkn ika! Oh.. mmg slalu gitu ke..? ish.. risau gak.. anak buah (danial) dulu rasanya x brapa nak masukkan benda dlm mulut..
Ish. macam dia sorang je masuk PLKN! hihihi.. Happy Mother's Day (08) ! 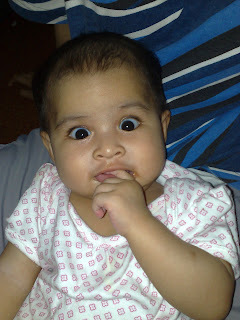 ALia is now 5 Month!